The objectives of the study were to model the developmental trajectories of physical aggression (PA) from toddlerhood to pre-adolescence and to identify risk factors that distinguish typical (normative) from atypical developmental patterns. Ten cohorts of approximately 1,000 children (n = 10,658) drawn form a nationally representative (Canadian) sample were followed over 6 years. Using a group based trajectory approach, we identified three groups of children with distinct developmental trajectories between 2 and 11 years of age. One third of the children (31.1%) followed a low desisting trajectory, reflected in infrequent use of PA in toddlerhood and virtually no PA by pre-adolescence. The majority of children (52.2%) followed a moderate desisting trajectory, reflected in occasional use of PA in toddlerhood and infrequent use by pre-adolescence. One sixth of the children (16.6%) followed a high stable trajectory of PA. Multivariate logistic regression indicated that children in the high PA trajectory group were more likely to be boys (OR: 1.67; CI: 1.5–1.87), from low income families (OR: 1.4; CI; 1.27–1.67), from families where the mother had not completed high school (OR: 1.20; CI: 1.05–1.38) and who reported using hostile/ineffective parenting strategies (OR: 1.16; CI: 1.14–1.18). In sum, the results indicate that the typical developmental pattern of PA was one of occasional and declining use over time. 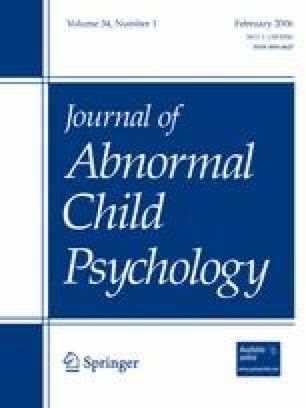 However, about one sixth of children, mostly boys from disadvantaged families, exhibited an atypical developmental pattern reflected in more frequent and stable use of PA. The results suggest that most children learned relatively well to inhibit PA by the end of childhood and that a minority failed to do so. Family risks traditionally found to be associated with antisocial behaviors during adolescence appear to interfere with the socialization of PA during early and middle childhood. This research was supported by research grants from Quebec's FQRSC and CIQSS, from Canada's CIHR and SSHRC, from the Canadian Institute for Advanced Research, the Molson foundation, St-Justine Hospital's Research Center and the University of Montréal. We thank Franck Larouche (Statistics Canada) for his sustained commitment to assist us in managing the data and Danielle Forest (University of Montréal) for her precious help with statistical analyses.